Hello! Since most kids are on summer break and are probably driving you crazy I thought I could show you a fun and easy Fourth of July craft that you can make with your kids. The main ingredients are a soup/vegetable can, Mod podge, digital stamps and paper. Yep, we are going to turn a can into something CUTE!! I'm also giving you a sneak peak into one of the Digital Stamps, Stitchy Stars, that will be released on Friday, June 15th. Step 2: Drill a hole in the center of your can. Cut out cardstock that will fit around your can. I used a 5 in circle for top of the rocket. Step 4: Place paper around the can. To help it secure to the mod podge/can I put tap on the edge. Step 6: Once the modge podge is dry on the circle find the middle of the circle and cut out a pie shape (triangle). Then I took a hole punch and punched a hole at the point of the triangle. Step 7: Put 1/4 inch scor-tape on the edge that will be folded on top of the other to make the cone. See photo above. Step 8: Open up Microsoft Word. In upper left corner click the tab that says "Insert". Then hit the tab that says "Picture". Then a screen will pop up and you pick the file you want to open. I used the NEW digital stamp Stitchy Stars that comes out on Friday! To resize the photo put your curser on a corner and a diaganol arrow will appear. Left click on your mouse and drag to the size you want it. Using the corner allows the image to stay in porportion. When you get it the size you want right click on the mouse. A screen pops up hit "Copy". The put your cursor to an empty place and right click and hit "Paste". Do that for as many stars you want in that design. Once they are printed cut them out. Step 9: The smaller stars put in the Xyron X to turn them into a sticker. For the larger pieces I used the Xyron 5" creat a sticker. When they come out of the machine I use a stylus and go around the edges to separate any sticky from the edges of the paper. Step 10: Decorate the can. Leave space at bottom of the can and bottom of the cone because that is where the decorative trim will go.Cover with Modge-Podge to protect it and to help the stickers stay on since it is a round object. Step 11: Once the top layer of Modge Podge is dry take the ribbon and put it through the hole in the cone and the top of the can. Tie a know at the bottom of the ribbon to keep it from being pulled out of the can. Step 12: If you are going to place this against a wall or window I suggect putting scor-tape on the inside of the cone so it sticks the cone to the top of the can. Step 13: Put 1/8 inch scor-tape around the bottom edge of the can and bottom edge of the cone. Add the sequins trim. Step 14: Put 1/2 inch scor-tape on the inside of the can along the edge. Then take your streamers and stick them on the scor-tape. Step 15: Hang up and enjoy! The stars on the can I punched out. The stars on the bottom that are hanging are Paper Pieced Stars from the Stitchy Stars Digital Image. I modge podge them and once they were dry I put them in a Xyron sticker maker to make them sticky on the back. I placed the ribbon between the two stars so they are a double sided image. I hope you have fun creating with your kid(s). If you make these please let me know as I would love to see what you come up with! P.S. - I want to thank my husband for brainstorming with me and helping me come up with this awesome idea. I'm also making these as a craft at a local retirement home so they can hang them on their doors! So even if you don't decorate donate them and brighten someone else's day. Digital Stamps are soooooo much FUN!!! Hello everyone! Sure doesn't seem like Tuesday after having a holiday weekend but it is!! So I'm here with another wonderful gift idea using digital stamps, transfer sheets and a shirt, bag or apron! The possiblities are endless!! I have NEVER used an Iron Transfer before. I have wanted to but thought they were a lot harder then they turned out to be!! Plus, with digital stamps and ones that are pre-colored this turned out to be a breeze! If I can do this YOU can do this!! Step 2: In upper left corner click on the tab that says "INSERT"
Step 4: Pick image that you want (I used PNG file but I'm sure you could use JPEG if you wanted). I used Patriotic Charlie Digital Image It is already colored so I didn't have to do anything to it. Step 6: If you want to flip the image so you would have a mirrored image go to the tab in the upper left that says "PAGE LAYOUT" and click on that. Then go to tab that says "ROTATE" Click on the arrow below the word "ROTATE" and options will appear. Click on "FLIP HORIZONTAL"
***NOTE: You will want the mirror image when you print it out so when you place it on the item it will read correctly. Some programs will do this automatically when you tell it in the print stage that you are using a T-shirt Transfer. If your program does not automatically flip it then you will have to do this step. Step 7: I added the word picture and sized it just as I did the Charlie image. Step 8: Go to the yellow symbol in the upper left corner of your screen. Click on it and a menu screen pops up. Click on PRINT. Step 9: Click on the tab that says "MAIN"
Step 10: Hit the drop down arrow for MEDIA TYPE and click on "T-SHIRT TRANSFERS". Hit OK. It will go back one screen hit OK and it should print. DO THIS ON REGULAR PAPER FIRST BEFORE PUTTING IN THE TRANSFER PAPER. Make sure that it prints a mirror image (SEE PHOTO BELOW) so it will be correct when placed on the shirt. Step 12: After washing item iron it so you have a flat surfact. Step 14: After it cools peel off transfer paper to reveal the image on the shirt!! Now my niece Kenzee has a One-of-a-Kind-Totally-Cool shirt for July 4th!! Here are other samples I made following the instructions above! I found the sentiment on-line and typed it in word. This is for my niece Kailee since her birthday is in August! This is what happens when you don't cut around the image and get most of the clear cut off. Wanted to show you my mistake so you don't make the same mistake! Also, next time I will cut off "For the" and just have "King of the Grill"
For my friend....can't tell who case she see's this! I colored them in Photoshop using the paint bucket. Stitched the black trail lines. I add a little stitching and love the look it gave it. Thanks so much for stopping by! Hope this inspires you. Good Tuesday Tutorial to you. Today's tutorial was inspired by a project I saw on Amanda Corbet's blog. 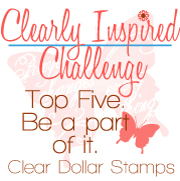 I made a change on the dimensions, the tutorial is in my own words and shown using Clear Dollar Stamps Products. I think you'll like it as much as I do. It is easy and whips up quickly depending on how much you decide to embellish it. But that is the fun part isn't it. I will show you a few ideas for using it also at the end. Easter and Mother's Day are coming up. Start with a 3 1/2 x 11" piece of NIGHT ECLIPSE CARDSTOCK. Score at 4, 5 1/4, 9 1/4, 10 1/2 along the 11" side of your paper. (It is hard to see MY score lines on the dark paper). Now turn your cardstock to the left so your 3 1/2 " side is up against the top of your SCOR-PAL. Score at 1 1/4. Here you just cut your flaps. Along the bottom here you cut at your score lines up to the 1 1/4" score line...cut out the right hand bottom corner. (In my photo I pulled up my flaps a little so you could see ...that is all. It looks like there is a notch cut out...there is not but the right corner). Now fold using a bone folder along all your score lines. Place a piece of Score Tape along your right flap. Flip over and place two pieces of score tape on the left 4" long flap on the bottom. On the inside piece of tape next to the score line...leave a little space between it and the score line so it doesn't stick to your other flaps when putting together. Remove the top piece from your score tape on the side flap and adhere. This is what it looks like. Now take the top bottom flap (long one that does not have score tape on it) and fold under on the bottom of the box then fold in the little bottom side flaps. Remove the top pieces from your score tape and fold up the bottom flap. The box part of our project is done. Print out your digital image. I am using JESUS HANDS COLOR DIGI. You need two pieces 3 x 5". I used the digital paper that is in this digi as my background and placed my image and sentiment on top. If your image goes underneath what you are putting it on top of just right click, select "order" then select "bring to front". Now here's your two 3 x 5 pieces cut out. If you want to punch your corners, now is the time to do it. I punched my top corners using a large round corner punch. Now cut out two pieces of NIGHT ECLIPSE CARDSTOCK 3 1/8 x 5 1/8". I punched these corners as well. Adhere your black mat pieces to your digi pieces. Now cut two pieces of COTTON CANDY CARDSTOCK 3 3/8 x 5 3/8". I rounded my top corners. Adhere the Cotton Candy cardstock panels to your digi panels. Punch out a small oval (or any shape you desire, I personally love the look of the oval) up toward the top of your digi panels. I punched out my oval on one. Then put my punched out panel on the unpunched panel traced lightly the oval shape with a pencil. Then I lined up my punch upside down and punched out my oval. Now they are even on both sides. Place a piece of score tape at the top of the box centered on both sides. Place a piece of score tape on the back of each digi panel along the bottom. Center each panel on the sides of the box and adhere. I tied a bow at the top, added Easter grass and filled it with dark chocolate eggs. Here's one I made for Mother's Day using the beautiful digi TULIP WREATH. I just love how this one turned out using these happy daisies from CHARLIE DAISY COLOR. The sentiment is from my digi NESTERS. Thanks for joining me. I hope you have fun making this project. I made this 6 x 6 album completely out of Basic Grey's Little Black Dress 6 x 6 Paper Pad. If you don't have this paper pad it is a MUST!! It made it so easy and fun to create this. I also loved how it was romantic but easily made manly all at the same time! This tutorial is more about a Gift Idea and inspiration for you to be creative this Valentine's Day. My husband will totally be surprised and shocked when I give him this as it will be a first in 14 years of marriage. I decided to not only give him a coupon book but to make it a mini album so we can write about or take photos as we make memories with each coupon that is used. Book - Step 2: Take your piece of 6 x 12 cardstock and score each one in the middle at 6 inches. Book - Step 3: Once you have all your black cardstock scored you will staple them in the middle to make a book. Now it is time to decorate the pages. You will make a coupon for each page and this is how I did that. Coupon - Step 2: Type up what you want it to say in Word then print it out on plain paper. Coupon - Step 4: Put paper in printer and reprint the coupon. When you make the cover of the book I put down Scor-Tape (double sided tacky tape) to adhere the ribbon to the book. I did this on the front and back of the book. See below. I have done all the "thinking" for you, now all you have to do is create (I did this in one day)! Have fun and if you create one let me know as I would love to see it. Hi! It's Kathy D. and yep I'm giving you permission to eat the goodies out of the Christmas tins so you can have them for your next craft project!! I thought of some cute (if I say so myself!!) gifts using up those Christmas tins. You will see that these can be used for any occasion depending on the images and how you decorate the tin. Step 1: Get the bee image from I Love You BeeCause Digital Image and print it out on yellow paper. I made my bees so the height was 3.5 inches and the width was 4.446 inches. Then also print them out on blue paper (for the wings). Do this as many times as you need to. I used scrap paper and just taped it to some white paper so it would feed through the printer. Step 3: put a piece of 1/2 score tape on the back of the bee towards the top. This is where you will stick the wings on. See picture below. Step 6: If you use Dum Dum lollipops cut matching yellow strips that are 2 3/4" long and 3/4" tall. If you use a different lollipop then your strip to cover them will be different. Then score each edge of the yellow strip at 3/8 (which is the 3rd line from the left if you have a scor-pal). Step 7: put 1/4 inch scor-tape on each end. Set these and the bees to the side while we get the lollipops ready. Step 8: I used Dum dum lollipops. You could use skewers, wood sticks, popsicle sticks, straws, etc. I used a kitchen scissor tool to cut wood skewers down to size. I varied the sizes and some didn't get any sticks added to them. Using scotch-tape tape the wood piece to the lollipop stick. Step 9: Take green floral tape and wrap it around the sticks to make it look like a green stem. Step 11: Take the strip of yellow that has scor-tape on the ends and place over the lollipop. Step 1: I used my SCAL program for the cricut to cut out the flowers from the May 2011 Card Cut File here at Clear Dollar Stamps. The flowers are cut at about 2 1/4 inches. Once you have them all cut out then use adhesive to stick them together as shown above. Step 2: Do the same thing that you did with the bees to mount the lollipops on the back of the flowers. Once you have those done set them to the side with the bees. Step 3: Grab your tin, Mod podge and a sponge brush. Measure the width of the tin and cut your paper to fit. This tin was 3 1/4 inches wide. I cut 2 strips out of 12 x 12 paper. I put mod podge on the back of the paper then stuck the paper on the tin. Step 4: after putting on the paper I put 1/2 inch scor-tape around the top so I could add ribbon to the can. Also add your flower foam to the inside of the tin. Step 6: Add the wonderful bees and flowers to the tin to make your Spring Bouquet! Or if you wanted to make a Valentine bouquet for your kids class or at the office you could do Bees and Hearts!! Here I took an upright rectangle tin and turned it into a Masculine bouquet to give my Honey Bunny for Valentine's Day!! I think I will get some Hersey kisses to put on the bottom in the Spanish Moss. I used flower stem wire on the hearts and glued another heart behind them to hide the wire. I used a wood skewer on the owl as it just seems to fit the wood theme! I cut the hearts out on my cricut using Basic George cartridge. I hope you enjoyed this tutorial! Have a Merry Christmas and I will see you next Year!! Welcome to another Tuesday Tutorial! I'm dedicating this post to our sweet Katie Renz. Today I am featuring one of my new digi sets called "Snowflake Cupcake Wrappers". I have found a super quick and easy way to give cupcakes as gifts or to just decorate for parties. This is what my "Snowflakes Cupcake Wrappers" set looks like. It is available now for just $2.50 for instant download. Cut the wrapper out with scissors and punch the topper with a 1 1/2" circle punch. Use some coordinating cardstock to stiffen up the wrappers and add some more detail. Temporarily attach the wrapper to the cardstock with just a tiny bit of tape runner to hold it to the cardstock while you cut around it. I used a round scalloped Nestability that is just a little bigger then the topper, to cut a coordinating circle. Gently peel the printed wrapper up and use more tape runner to attach the printed paper to the cardstock on both pieces. Then run a line of tape to the inside of the assembled wrapper. Bring it around and attach it to the other end. Another thing I do is to set the baked cupcake down in a foil cupcake wrapper so that oils don't soak into the outer wrapper and spoil the look. To keep the cupcake from getting squished and the frosting from getting messed up in the bag, I first drop it down in a clear Dixie cup. Then place it in a clear treat bag. This time we are turning the topper into a tag, so you will need to use a hole punch to punch a hole. Tie a pretty ribbon that coordinates with the wrapper, then attach both with the twisty ties that come with the treat bags. The cupcake recipe is super yummy too. My own creation and I call it "True's Blue Hawaii Cupcakes". Day 2 of Wrap it in Style! Welcom to Day 2 of Wrap it with Style! Hope you enjoyed the day with your family yesterday. Did you brave the stores this morning ? Not me, I steer clear of the stores from Nov 1 till Christmas. My tradition is to make a list of things I want that way I know I will get something I like and want. But this way I don't know exactly what I'm getting and can be surprised at Christmas time. Unfortunetly my in-laws just want gift cards. They aren't much fun to wrap but hopefully this next idea makes it a little more interesting. I decided to go with a winter birthday theme. But you could make this in a Christmas theme or for any occasion that you want to give a gift card. Heck, you don't even have to put a gift card in it you could put a photo in it. Enough chit chat let’s get to it. Print out two images. Color both. One of the images you will cut out the hat, balloons, present and cake so you can pop dot it onto the main image. Take the base of the card (5 1/2 x 8 1/2) and score it at 4 1/4. Next we are going to score the piece that will become the pop up that the gift card sits in. Make sure that the 6 inch side is horizontal as you see in the photo above. Now we are going to crease down the folds. I numbered mine just so you can see how I am folding each one. Here is what it should look like after you crease the folds. Take 1/4 inch score-tape and place where you see above in the photograph. Place the edge of pop up piece flesh with the fold of the card. Take off the coverings of the small pieces. You use small pieces because you want to leave room for the gift card to sit in there. Take the last section and attach it so it makes a 90 degree angle as shown above. Take your bone folder and crease the card down to make it fold better. Now you can decorate your card however you want. I used Sketch 129-33 from Sweet Sketch Wednesday. Now we will make a gift card set that comes in box. Cardstock – Bazzill, Patterned Papers – For the box I used Paper Salon (stiched harlequin) and Berry Blast Cardstock, for the cards I used misc from my scrap drawers. I scored down each line to give it some texture. Cut on the dotted lines you see in the photo above. Take your bone and crease the main folds so they wil be easier to fold over. Take 1/4 inch score tape and place on all four pieces you see in the above photo. Once you take the coverings off the score tape fold the edges in. Then you will have the bottom portion of your box. Now to make the lid. I used patterned paper that was double sided and as thick as cardstock. Use your bone folder and crease down the score marks so it makes it easier to fold. Put 1/4 inch score-tape on all four corner pieces as shown in the photo above. Fold the edge over and glue down. Then you will have the lid to your box. Now it is time to decorate it. Mine is a thank you gift to the owner of the Jazzercise club I go to. I made a set of cards to go inside of the box. The turkeys are paper pieced by printing the image out on different colored cardstock then cutting each piece out. The cards inside are blank or say "Happy Birthday" or "Thinking of You"
Here is to show you that making beautiful containers for your gifts can be an activity shared with kids. My 8 yoa niece, Kailee, is with us this weekend and we had hot chocolate the other night. The canister was empty and it came with a cute metal scooper. So we decided to decorate it tonight so she can get some of her moms favorite coffee in there and give it to her for Christmas. I walked her through and did the cutting. She did everything else. I laid out the supplies and this is what she came up with! That is what it looked liked and this is what she turned it into. I hope you enjoyed these past two days with learning different ways to Wrap it in Style! It's Kathy D., with a Thanksgiving two day special with tutorials on how to wrap it in style! I figured you will be going shopping later tonight and tomorrow to get all those deals and would need some cute packaging ideals. So first up are ideals on how to spruce up plain bags and make them something special that the receiver will just love to have. As you can see the bags can be simple or more in detail it is all up to you. Let's start with the stocking bag. Print out the image (5.3 in x 3.2 in) twice one on cream paper and one on white paper. Print out tag on cream paper. Cut out the bottom of the cream stocking as seen above. Cut out the top of the white stocking as seen above. **to cover up any imperfections from your cutting take a black marker and outline the image. Glue down the white top piece on the cream stocking. Put pop dots on the back to make it look 3-D.
Cut the stripped patterned paper 1 1/2 x 9 inches. Punch one edge with a scalloped punch. Cut the green patterned paper 5 1/2 x 8 1/4 inches. Cut the red 5 x 6 3/4. Punch with edge and corner punch. Punch 3 small circles and adhere as shown. Fill with presents and you are ready for Christmas! The next one is a little more in depth. Use a medium size white craft bag. Put down 1/4 inch score tape at the top of the bag. Put down 1/2 inch score tape below that. Put down 1/4 inch score tape below that. So you have a skinny, fat, skinny layer of score tape. Rub on the skinny pieces to make sure they are sealed well. ONLY Take off the backing of the middle piece of score tape (1/2 inch). Pour dark blue glitter on the score-tape. Take off the two smaller pieces of score-tape backing and pour light blue glitter on it. Add patterned paper to the bottom of the bag. Print out two images of the Toasty Bears (3.6 inches high). Cut out one image and put pop dots on the back of them. Cut out the other image leaving a white border. Mat on blue and then on white. Adhear the image to the bag. I traced out a scallop circle I had to make a tag. Print saying on the middle circle. And here is a real simple one. Enjoy the rest of the day with your family and I will see you tomorrow after your shopping is done to give you more ways to Wrap It with Style! Tuesday Tutorial ~ Fun Fall Cupcake Wrappers! For today's Tuesday Tutorial, I'm going to treat you with something a little different. You get to be the first to get a peek at the new Fall Cupcake Wrappers that I created for Clear Dollar Stamps! They are available for instant download starting today for just $3.00! I'll show you just how quick, easy, and fun they are to create. First you need to arrange them in MS Word or whatever photo or drawing program you use. Two fit nicely on a page and you have room for 4 toppers. (I like using 2 for each so there is a front and back to the toppers). After you print them off, you need to cut them out. I have used scalloped scissors to cut the tops of some of the cups for a little added detail. I hand cut my toppers but you could use a punch or die if you would like. To make the toppers, just run some ATG tape or other adhesive along the backs of the toppers, then sandwich a toothpick between them. To create the cup, run some tape along the top side of one of the short edges of the cup curve. Bring the other end around and adhere. If you don't have an ATG, you can also put them together with plain ol' Scotch tape. #1 - I used the paper lined foil cupcake cups that you can buy in most grocery or discount stores. This will keep oils from the cupcake from seeping through your wrappers. #2. - You can make your cups lose so the cupcakes sit down in them or tighten them up a bit so the cupcakes set up higher in the cups as I did. We would love to hear what you think about our cupcake wrappers. Would you like to see more styles for different occasions and holidays?